Guy Harris is Event Director - Space Tech Expo. Now in its 2nd year, Space Tech Expo brings together global decision makers involved in the design, build, and testing of spacecraft, satellite, launch vehicle, and space-related technologies. 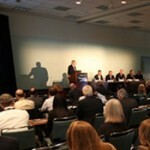 The trade show and conference will be held May 21-23rd, 2013 at the Long Beach Convention Center. As one of the largest industry gatherings in the world, Space Tech Expo attracts scientists, engineers, C-level professionals, government representatives, policy makers, space agencies, military, venture capitalists and investors, industry entrepreneurs, and buyers from the satellite communications marketplace. With over 140 exhibiting companies, Space Tech Expo is a full-line event established to introduce the supply chain to the wider buying chain.